Boy, it’s a manga issue again already? It feels like I just did one of these, like, 9 volumes ago. You may remember from last week’s review that I had just gotten a tattoo right before I wrote it. Well, it’s a few days later at this point, and now it’s just itchy. So, so itchy. Unpleasantly so! I’m not supposed to be scratching it, but it’s 9 days old at this point; I think it’s about as healed as it is going to get. Shh, don’t tell anyone. There are a lot of Shonen Jump series from over the years, but they are all over the map in terms of how I feel about them. Many of them are pretty formulaic in how they are handled—starting with humor, the hero gains more and more power to fight progressively more serious and dire foes—but for me, it often comes down to the art, characters, and the dialogue as to whether I dig them or not. Naruto and One Piece are both really popular, but neither appealed to me (the art in One Piece is too silly, and Naruto just never “caught” me for whatever reason), for example. But there are a bunch I did fall for, even if the plots feel rehashed a great bit from one title to the next. 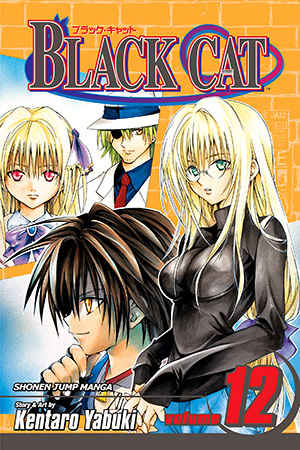 Black Cat is a relatively short SJ series at just twenty manga volumes (as opposed to Naruto and One Piece and Bleach, which all feel like they have a billion), and it sticks to one core storyline throughout. And as someone who has always enjoyed American serialized storytelling with books dedicated to Spider-Man or The Avengers running for several decades, I have to say… I’m thankful for that. When it comes to Green Lantern, I am in it for the long haul to see this character’s entire life and challenge after tribulation, but in terms of manga, I usually appreciate it most when there is a dedicated story arc with an end game in mind. 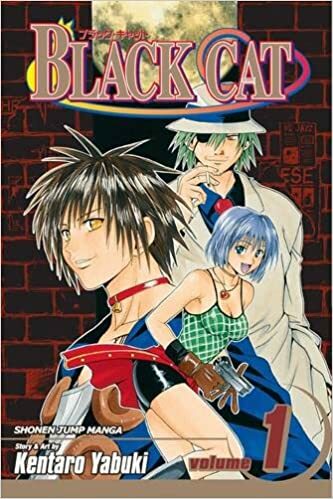 The tale here is of protagonist and titular “Black Cat,” Train Heartnet living the life of a sweeper (a bounty hunter) in the years after having abandoned his life as an eraser (assassin) for the worldwide security organization Chronos. Train was formerly one of the Chronos “Numbers”, the most elite of Chronos, each marked with a number; the Black Cat who delivered bad luck to his targets was, of course, number Thirteen. But after growing tired of bloodshed and being controlled by others, Heartnet abandoned the organization and partnered up with a former detective named Sven to start new lives as sweepers. Very early into the series, the two are roped into helping out Rinslet, who, if you want to keep up with the theme of cats, is very much the Selina Kyle/Felicia Hardy of the book in that she is a thief with a heart of gold. They also meet Eve, a very young girl who was created using nanomachines to be a killer for the mob, but who wants more out of life, and Sven gets her to break her programming and join them to be free. These four form the core heroes of the group (though Rinslet tends to float in and out of the book), with the primary adversary being revealed as Creed Diskenth… a former partner of Train’s in Chronos who has started his own underground organization known as The Apostles of the Stars. Black Cat is a fun, if light, manga. The story isn’t immensely deep, and with just one plot and 20 volumes to work it out, there’s not a lot of room for subplots or nuanced character growth. There is an abundance of characters, and while some do have a layered characterization, many—especially the mini-bosses of the Apostles of the Stars—are pretty one-note and shallow. There’s also a fair amount of Batman Syndrome for lack of a better term; lots of characters, including Train himself, are deeply impacted by loss or lack of parents. By the time you get to the backstory of Leon—a child working for the Apostles— in volume #15, his story just feels somewhat reheated. All that said, if you just go into this series expecting exaggerated fight scenes, humorous characters, creative super powers, and some interesting world-building, Black Cat completely delivers. Not every book is Maus, you know? Train is a great protagonist. A lot of SJ series are defined by having somewhat obnoxious main characters backed up by a more worthwhile supporting cast; the supporting cast here is wonderful, but Train is genuinely engaging throughout. The art is crisp, too. It may not deviate much from the standard that folks think of as stereotypically “manga”, but it’s exceedingly clean and has solid, defined linework. Of all the manga I have read, Yabuki’s art is in my personal top five. An interesting note on Black Cat: a lot of manga have weird translations to anime. Death Note, which I reviewed earlier, is almost strictly word-for-word a retelling of the manga in its animated form. Series like Dragon Ball Z and Full Metal Alchemist are chock full of filler episodes that depart from the source material. Black Cat is a wild one in that the anime is a complete reimagining of the manga. It tells almost a completely different story with the same plot. For whatever reason, that has been a barrier I haven’t fully overcome, but… I’ll get around to watching more of it eventually. Talking Point: After talking about how upper tier Train is a Shonen Jump main character, I’d be at a loss to not talk about how delightful Sven and Eve are. Eve, in particular, is a dynamic star of the book. So… what supporting character in manga is your favorite of all time? There is so much fun to be had here, and there are so many powerful fight scenes from start to finish. The story isn’t a masterpiece, but it doesn’t meander and feel made up on the fly, either.